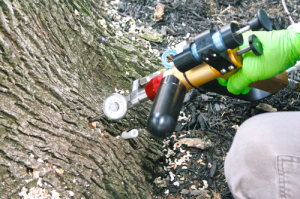 Ada Tree Service professionals have a variety of options available for controlling tree pests. Injections and implants that place insecticides directly inside trees are being used more commonly as people become more concerned about the effects of pesticides in the environment. Tree injections and implants can be very effective against certain kinds of pests. They have several advantages over sprays and soil treatment. • The chemical is put directly into the tree where it is picked up only by the insects feeding on the tree, and where it is away from people, wildlife, beneficial insects, and other non-target organisms.